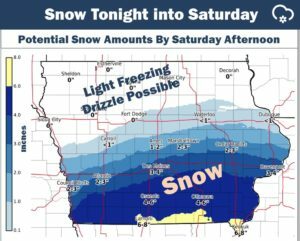 Much of the southern third-to-half of Iowa should be buried under snow by Saturday afternoon. Allan Curtis, a meteorologist with the National Weather Service office in Johnston, says the snow is expected to start falling by late this afternoon. “We’re not looking at extreme totals by any stretch, but totals could range from as much as four to six inches towards the Missouri border and more towards the one to three inch range around I-80 and just north of there,” Curtis said. According to Curtis, blowing snow should be limited with this system. “One thing that’s relatively unusual is we’re not expecting any winds with this, so it’s going to be a nice, pretty snowfall,” Curtis said. Residents of northern Iowa can expect to see only light freezing drizzle late tonight into tomorrow. For many people in the southern half of the state, this will be the first significant snowfall of the season. A Winter Weather Advisory is posted for an area along-and-south of Interstate 80. Once the snow tapers off on Saturday, mild conditions are expected through the weekend with highs mainly in the 30s to low 40s.